Slot games don’t come any bigger than Viking Runecraft from Play ‘N Go. By bigger, I mean the slots grid itself. At 7 x 7 reels, the slot is the first of its kind from the Swedish developer. Safe to say we got excited rather quickly in the office. Because more reels mean more chances of winning, especially as the Viking Runecraft slot offers different levels, a bonus wheel and so much more at its 96.0% payout rate. I won’t beat around the bush; normally new slot games are rehashed garbage rushed out to line the pockets of casinos. Not here, Viking Runecraft from Play ‘N Go is original, highly playable and super cool. In fact, it’s one of the best 10p slots I’ve played all year on playability and pay table grounds alone. Few new slots can offer the payout power, multiple levels or systematic winning of Viking Runecraft! With its Norse theme, advanced graphics and high-spec bonus features, you can’t help spinning it. The game is available to play on mobile, tablet and desktop while spins of 10p to £100 covers all betting personalties. What I like most is the effect of cascading symbols for multiple wins and a 5000 x betting stake maximum win on any spin. The 10p online slots market comes crammed with crap; I welcome the fresh air with this one. The graphics in Viking Runecraft do not disappoint and decorate a very capable gaming machine underneath. What’s even better is the slots animation sequences, sound effects and the dramatisation of winning scenarios. Some new slot games get boring very quickly. You press the button, it spins, and you wait to win. Boring (unless you win). In this game, we don’t get that. It’s interesting; the playability is engaging, and there’s plenty going on. Play ‘N Go Viking Runecraft is a very energetic slot with plenty of bang for that low 10p spin cost. Runestones, you can’t just get enough of them, unless you’re playing a 7 x 7 reel 10p slot game. The pay table for this one is huge, but that’s what we like about it too. Higher paying symbols come in the form of armour and weapons while runestones pay less and occupy the bottom of the paytable. In Viking Runecraft, think bigger. Winning combinations can be as big as 15 plus symbols in a line, but they’re also the biggest cash prizes. For example: If playing the slot at 10p, the pay table would award 2p for 5 x green runestones. If however, you get 15 x Hammer weapons, the pay table would award £100. If playing at £100 a spin, the slot jackpot would be £100,000. Holy Vikings! At Slotsquad, we like slots you can play for 10p with lots of return potential. If you’re going to win playing any slot game, it’s the features that you’re most likely to do it. I mean big wins by the way. With Viking Runecraft, you need to move away from normal slot routines. Things are different here. Firstly it’s a massive pay table and secondly, the game uses levels and sidelines. If you’re confused, then join me being confused. I’ve read some marketing babble about this game, we all have. You know, the stuff that says align with the gods and defeat evil, etc., etc., I just want to play a slot for 10p and win some flaming money in the process! So how do you go about doing that? Firstly on opening the game, there’s a hint of help. You’ll quickly see the following labels: Gods, Level, Valhalla and Charge. Believe it or not, but these are the fundamentals of the Viking Runecraft slot features. If you play Viking Runecraft for real money and I am for 10p in this review, Gods Odin, Thor, Freya and Heimdall play beside you. It’s all about Gift of the Gods and what’s even better, if you don’t win on a spin, the Gods kick in. Happening in the base game, the Gift of the Gods feature is a nice to have additional extra. It’s fairly cool as well. Look to the right of the reels; you’ll see a God standing beside you. They all do the same thing by supplying Wilds to the game, therefore trying to generate winning combinations if you lack them. Thanks Gods. 10p online slots with 96% payout rates are worth spinning, especially if they have levels. Enter the Viking Runecraft slot level feature. Ok, we can simply connect this to the Gods above. You start playing; you start at level 1, the higher the level, the more payout power involved. To progress through the levels, you clear patterns by winning on all indicated positions on that pattern. On each level, you’ll get a different god with even more payout power. The good news, if you’re winning, you’re moving up levels. The Runes of Valhalla sounds important doesn’t it, I thought that when I first read it. It sounds like it pays out and does something that helps you win. It does. 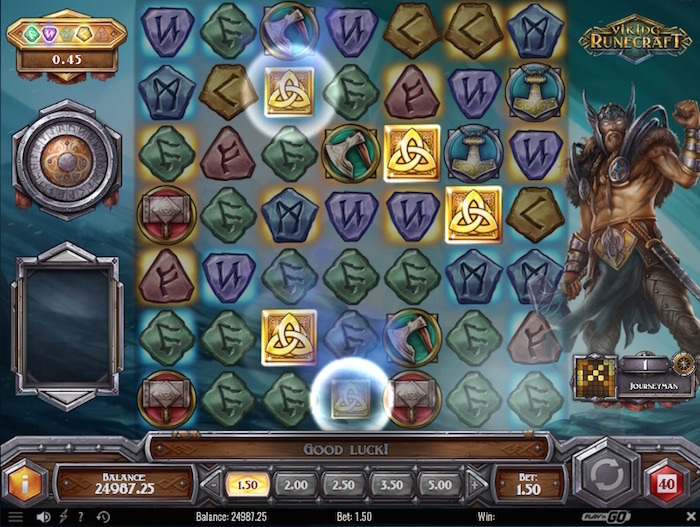 Look to the top left of the game while playing, see that collection of faded runestones. You just need to fill them in by collecting runestone wins. The more runes you have collected, the better chance you have of winning the Valhalla bonus pot. Note: the bonus grows at a rate of 12% of symbol win amounts. Another nice addition. If you can collect at least one runestone win and clear the current level winning pattern, you’ll activate the bonus wheel. Spin it and hope for the best. It’s hit and miss, but if you hit you’ll take the value of the pot with you. Top tip, it’s common sense really but the more runes on the bonus wheel, the better your chances. Looks like a shield and located to the left of the reels. Perhaps that shield is protecting the game from us; I hope not. With every win, this shield starts charging, and when fully charged, it unleashes terrible events on the reels. But don’t worry, these terrible events are wonderful if you’re playing for real money. You’ll find more information in the pay table, but this shield essentially forces winning situations upon the reels. I:e the Lure of Loki will select some symbols and destroy others. It’s more slot Wild technology at work. Just charge that Shield and unleash the winning fury! Unlike most other new slot games, Play ‘N Go Viking Runecraft does not include free spins in its bonuses. Argh but wait, you do get one free round of play. But I would choose cascading symbols on 7 x 7 reels over free spins any day. The one free round of play is called Ragnorak and linked to the Charge of Destruction bonus above. At the end of this free round, you’ll get a Charge of Destruction bonus but with up to 15 x multipliers with the Ragnorak upgrade. If you’re looking to play online slots for 10p but increase bets as and when to suit your game plan, Viking Runecraft ticks the right boxes. You can play from 10p to £100 a spin if betting for real money and win by getting 5 x to 15 x (plus) symbols in a line. The payout rate RTP for the Viking Runecraft slot is 96.70%. The Jackpot for this game is 5000 x your betting stake. If playing for 10p that’s £500, or if playing for £100, it’s £500,000. It’s not hard these days to find online casinos with new slots that stink of old games. Cut and pasted ideas that represent nothing new, just the same old boring money spinner. I want to welcome Play ‘N Go’s major effort and its innovative cut from the rest. Viking Runecraft is exceptional; it’s 7 x 7 reels of brilliance and lots of payout power that becomes more powerful with every spin. And all for just 10p a play.